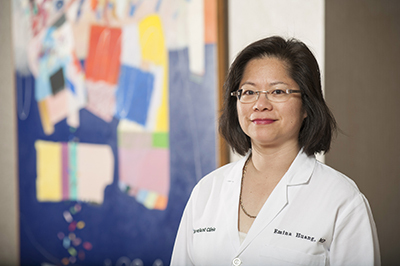 Last year, Cleveland Clinic researcher Emina Huang, MD, was awarded a collaborative, multi-million dollar grant from the National Cancer Institute (NCI) to create innovative disease models of colorectal cancer. In less than a year, she has already harnessed this support into new discoveries that will enhance the understanding of the disease. In a paper recently published in Oncotarget, Dr. Huang and her collaborators describe how they developed a special disease model, called an organotypic model, of ulcerative colitis (UC), an inflammatory bowel condition that can lead to colorectal cancer. Organotypic models, also referred to as organoids, are groups of human cells engineered in the laboratory to mimic the biological qualities of the larger organ on a much smaller scale. To create their organoid colon model, the team removed epithelial cells from the biopsied colons of patients with UC and healthy patients. The cells were embedded in a gel matrix and cultivated to create a three-dimensional organoid, or “mini-colon.” They then conducted a series of tissue and genetic analyses to investigate whether the model was a true representation of UC pathology. Dr. Huang’s team showed that the structural and cellular elements of the organoid matched those observed in patient colons and that the gene expression pattern of the UC organoid differed from the healthy organoid, namely among genes related to inflammation, metabolism, cell adhesion and cancer. Not only did the researchers validate their model and demonstrate that it can reliably be used to study processes related to UC and colorectal cancer, but they importantly identified new genes suspected to be involved in the disease process, including one called NPSR1. UC is a chronic disease that results when the body’s immune system mistakes food, bacteria and other things naturally found in the colon to be dangerous and attacks them as if they were pathogens or foreign invaders. This causes the colon to become inflamed and develop ulcer-like sores. If untreated, it can progress to colon cancer, which affects millions of adults in the United States and has poor survival. As such, new treatments are desperately needed. With work like this, Dr. Huang and her collaborators are making good progress. This project, which was funded by the National Institutes of Health as part of the NCI Tissue Engineering Collaborative Research Program, also received critical support from two Cleveland Clinic funding and philanthropic initiatives, the Centers of Excellence in Research Program and VeloSano. Dr. Huang co-directs Lerner Research Institute’s Center of Excellence in Colon Cancer Metastasis Research. The center, which won a competitive process in 2016 to receive initial funding, is currently working on several projects in addition to this one, including examining colon cancer’s cellular microenvironment as well as understanding how genetic changes may make colon cancer cells more aggressive in some individuals and how these changes may be reversed. By bringing together basic researchers and physicians to tackle these disease related questions, the Centers of Excellence in Research Program helps to speed research translation. A VeloSano award, Cleveland Clinic’s flagship philanthropic initiative to advance cancer research, also helped make this project possible. This is a great example of how philanthropy makes early-stage research possible, helping scientists collect enough data to earn funding from larger organizations and agencies that can propel their research to the next phase of discovery. Dr. Huang is a colorectal surgeon in the Digestive Disease and Surgery Institute’s Department of Colorectal Surgery and staff member in the Lerner Research Institute’s Department of Cancer Biology, Center for Cancer Stem Cell Research. Her collaborators on the NCI grant include Xiling Shen, PhD, Duke University, and Michael Shuler, PhD, Cornell University. Read more about the grant here.